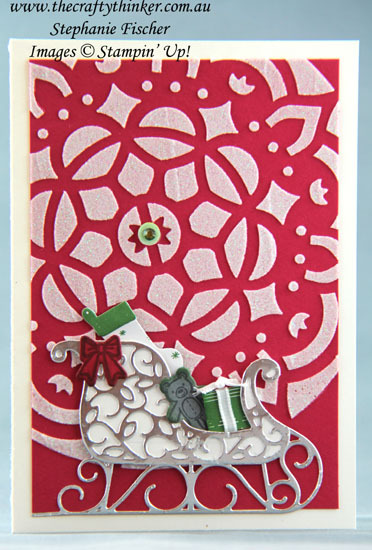 This card came about because I wanted to test out the new sparkly embossing paste that will be available in the Occasions Catalogue (3 January to 31 May 2018). 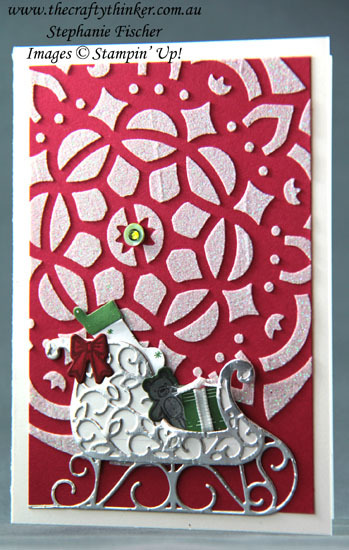 I was curious to see if/how the result would differ from using the plain white embossing paste with Dazzling Diamonds added. The result? It's just as sparkly - maybe a little finer and, best of all, I can save my Dazzling Diamonds for other purposes! So I had the red and white pattern and my mind went blank (not an unusual state of affairs!). When in doubt - add a sleigh full of gifts! Curious about the greenish embellishment? The Tutti-frutti Sequins are self-adhesive and will also be available in the new Occasions Catalogue. I noticed that the blue ones are so pale as to be almost transluscent so I layered one on top of a Lemon Lime Twist one to get a more muted green better suited to my colour scheme. In the centre is a Rhinestone Jewel that I coloured with Stampin' Blends alcohol markers.